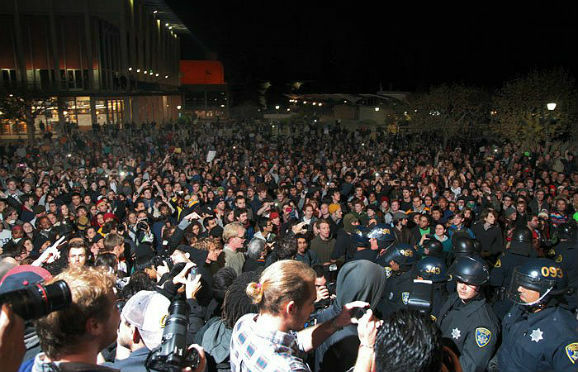 We could not agree with you more: UC Berkeley does share the principles of the OWS movement. In fact, we were instrumental in sparking the wave of occupations—yes, occupations—that is now sweeping the globe. Recall November 20th, 2009: the students who occupied Wheeler Hall that day were not fringe radicals or outsiders, they were students who cared so deeply about the university that they were willing to be dragged away in handcuffs for it. They spoke for all of us, and now we are answering back. The model of activism you refer to: it’s us. We’re all occupiers now. Don’t patronize us, then, by telling us how we ought to behave. Time and again, our protests have been met with batons and guns and admin-speak about “protecting us” and obeying the “limits of protest.” After three years of brutality, we now know exactly who is being protected, and from what. Yesterday, the police force you sent to disperse us beat and maimed several dozen students, faculty, and staff. When UCPD requested reciprocal aid, they were reinforced by OPD and the Alameda County Sheriffs Department—the same officers who shot a young Iraq veteran in the head with a tear-gas canister last week at Occupy Oakland, in violation of their own rules of engagement. He still has not regained the ability to speak. This is how you would protect us: with blood and fear. We are appalled, but not surprised, that your police beat an English Department graduate student so badly yesterday that he was rushed into urgent care. This is how you would uphold the legacy of the free speech movement. Let us remind you: we are the free speech movement. We are speaking, and you are beating us to the ground. About the “regular activities” of students at UC Berkeley: we do not agree that these activities can be limited to going to class, studying, and doing research. First, because this school is the center of our lives, which are richer and more meaningful than is allowed for by the student code of conduct. Second, because there can be no “regular activity” in a time of crisis. We are not blind to the world; we know that it is falling apart, torn to shreds by the profit-hungry elite of the the 1%. We know that you have been tasked with operating the university in crisis mode; we know this means ensuring that the 1% do not lose their financial stake in the university and its affiliate industries—the student loan racket, for example. We see right through you. It is you, on the other hand, who mistake our purposes: when we occupy buildings and set up encampments, these are our regular activities. The only people interfering with the business of the university are the police; for that, they should be banned from campus permanently and immediately. You describe UC Berkeley as “a place where the best and brightest youth, staff and faculty from all socioeconomic backgrounds work collectively to solve world problems.” We wholeheartedly agree. However, by this definition, it is you who have violated the code of conduct; you are the ones who should be driven out of Sproul Plaza, not us. Make no mistake: there can be no “regular activity” when a militarized police force is allowed to brutalize students with impunity, nor can there be any peace so long as you remain at the helm of the university. Take a lesson from history (Egypt, for example) and step down now.